There is no doubt that the S 100 is the barometer for what Summit were doing at any point in time. Whilst other model numbers came and went, the 100 seems to have been ever-present! These pens measure about 135mm, and seem to come with Warranted nibs. In the mid -1930's the S100 takes on the design that was going to become the familiar style of Summit / Lang products. Lambrou's "Fountain Pens of the World" notes that Summit pens were more conservative than their peers. I guess he was reviewing the post-WW2 productions, such as this S.100 below, rather than the Curzon delights above. Carrying the Summit name in isolation on the barrel stamp, these early Summit S.100's come with nickel trim as standard. The Summit name appears on the pocket clip of later productions, and the original nib seems to have routinely carried the Summit name. My experience is that these are less prone to discolouration, than the S.125 model, but that the furnishings are more likely to be found with corrosion / pitting. As post-WW2 production returned to something like normal, Summit expanded and rationalised their model range. 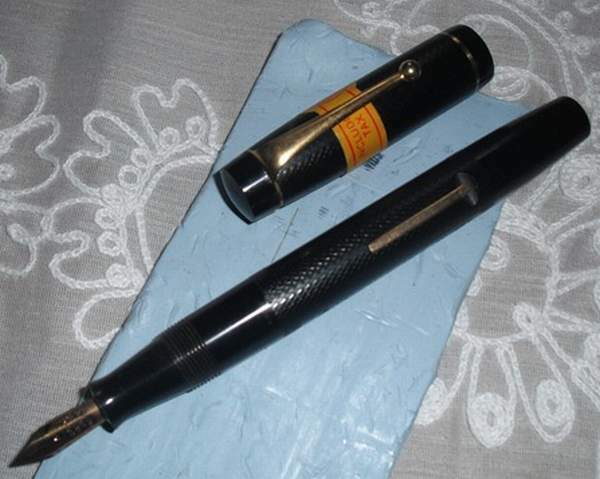 The S.100 was now clearly defined as a student - level pen, being given the "Cadet Model" label. However at 132mm the dimensions, and the general quality, matched the model above. 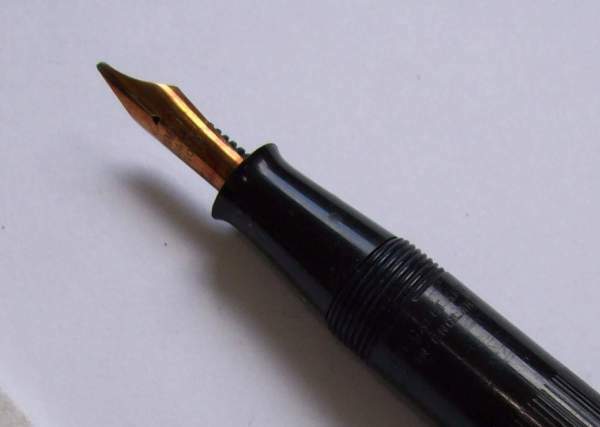 The nib remained 14ct, and carried the "CADET" name rather than Summit. A later S.100 Cadet was manufactured that resembled the later S.125 Mark 2, in that it came with the ribbed plastic barrel. The barrel stamp was also moved to run below the screw thread at the top of the barrel. Also like the 125, this pen had a 'cheap' feel to it, that is perhaps unjustified. The S.100 cadet with the ribbed barrel (and a 14ct Summit nib).